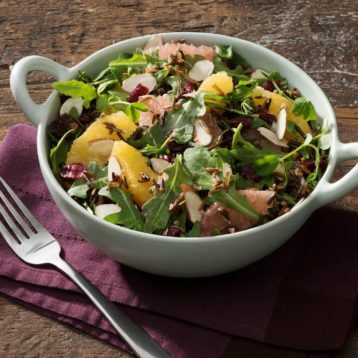 For Salad: In large bowl, combine rocket, wild rice and pea shoots; arrange grapefruit and orange segments over top. Sprinkle with almonds and chives. Scatter dried cranberries over top (if using). For Orange Vinaigrette: Whisk together vinegar, orange juice, shallot, mustard, salt and pepper; whisk in olive oil. Drizzle over salad; toss to combine. Add quartered fresh figs if desired.